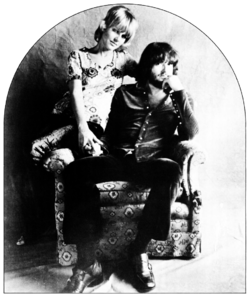 Delaney & Bonnie were the American musical duo of singer/songwriters Delaney and Bonnie Bramlett. In 1969 and 1970, they fronted a rock/soul ensemble, Delaney & Bonnie and Friends, whose members at different times included Duane Allman, Gregg Allman, George Harrison, Leon Russell, Bobby Whitlock, Dave Mason, Rita Coolidge, King Curtis, and Eric Clapton. Delaney Bramlett (July 1, 1939, Pontotoc County, Mississippi – December 27, 2008, Los Angeles) learned the guitar in his youth. He moved to Los Angeles in 1959, where he became a session musician. His most notable early work was as a member of the Shindogs, the house band for the ABC-TV series Shindig! (1964–66), which also included guitarist and keyboardist Leon Russell. Bonnie Bramlett (née Bonnie Lynn O'Farrell, born November 8, 1944, Alton, Illinois, United States) was an accomplished singer at an early age, performing with blues guitarist Albert King at age 14 and in the Ike & Tina Turner Revue at 19—the first white Ikette, "for three days in a black wig and Man Tan skin darkener." She moved to Los Angeles in 1967 and met and married Bramlett later that year. Delaney Bramlett and Leon Russell had many connections in the music business through their work in the Shindogs and formed a band of solid, if transient, musicians around Delaney and Bonnie. The band became known as "Delaney & Bonnie and Friends", because of its regular changes of personnel. They secured a recording contract with Stax Records after they had completed work on their first album, Home, in early 1969 at Russell's home studio, Skyhill (named after his address in Skyhill Drive, North Hollywood). In his 2007 autobiography, Eric Clapton claimed that Delaney & Bonnie and Friends were the first white group to sign a contract with Stax. Despite production and session assistance from Donald "Duck" Dunn, Isaac Hayes, and other Stax mainstays of the era, the album was not successful—perhaps because of poor promotion, as it was one of 27 albums simultaneously released by Stax in that label's initial attempt to establish itself in the album market. Delaney and Bonnie moved to Elektra Records for their second album, The Original Delaney & Bonnie & Friends (Accept No Substitute) (1969). While not a big seller either, it created a buzz in music industry circles when, upon hearing pre-release mixes of the album, George Harrison offered Delaney and Bonnie a contract with the Beatles' Apple Records label—which Delaney and Bonnie signed despite their prior contractual commitment to Elektra. The Apple contract was subsequently voided, but this incident began a falling-out between Delaney and Elektra, culminating in the band's release from their Elektra contract in late 1969. On the strength of Accept No Substitute, and at his friend Harrison's suggestion, Eric Clapton took Delaney & Bonnie and Friends on the road in mid-1969 as the opening act for his band Blind Faith. Clapton quickly became friends with Delaney, Bonnie and their band, preferring their music to Blind Faith's. Impressed by their live performances, he would often appear on stage with Delaney & Bonnie and Friends during this period, and he continued to record and tour with them following Blind Faith's August 1969 breakup. Clapton helped broker a new record deal for Delaney and Bonnie with his then-US label, Atco (Atlantic) Records, and performed (with Harrison, Dave Mason, and others) on Delaney and Bonnie's third album, the live On Tour with Eric Clapton (Atco; recorded in the UK, 7 December 1969, and released in North America in March 1970). This album would be their most successful, reaching number 29 on the Billboard album chart and achieving RIAA gold record status. Clapton also recruited Delaney and Bonnie and their band to back him on his debut solo album, recorded in late 1969 and early 1970 and produced by Delaney. By late 1971 Delaney and Bonnie's often tempestuous relationship began to show signs of strain. Their next album, Country Life, was rejected by Atco on grounds of poor quality, and Atco/Atlantic elected to sell Delaney and Bonnie's recording contract—including this album's master tapes—to CBS Records. Columbia released this album, in a different track sequence from that submitted to Atco, as D&B Together, in March 1972. It was Delaney and Bonnie's last album of new material. The couple divorced in 1973. Delaney and Bonnie continued to work in the music business after their breakup. In 1994 Delaney married musician/songwriter and engineer CoCo Carmel, they spent thirteen years recording many songs together including Delaney's solo record "Sounds From Home", and tracks that ultimately appeared on Delaney's final solo album, A New Kind of Blues, which was released in early 2008, only months before his death (see below). Bonnie enjoyed success during the 1970s and early 1980s as a backing singer with Elvin Bishop, Stephen Stills and the Allman Brothers Band. She subsequently turned to acting, appearing (using her later married name, Bonnie Sheridan) in a recurring role on the TV series Roseanne (1991–95). Her album Beautiful was released in 2008. Delaney and Bonnie are generally best remembered for their albums On Tour with Eric Clapton and Motel Shot. On Tour was their best-selling album by far, and is (except for their version of "Come On in My Kitchen" with Duane Allman, released after Delaney and Bonnie's breakup and Allman's death) the only official document of their live work. Delaney and Bonnie were considered by many to be at their best on stage. In his autobiography, Atlantic Records executive Jerry Wexler stated that the studio album he produced for the band, To Bonnie from Delaney, "didn't quite catch the fire of their live performances." Clapton makes an even stronger statement in his autobiography: "For me, going on [with Blind Faith] after Delaney and Bonnie was really, really tough, because I thought they were miles better than us." Motel Shot, although technically a studio album, was largely recorded "live in the studio" with acoustic instruments — a rarity for rock bands at the time. Delaney and Bonnie's "Friends" of the band's 1969-70 heyday also had considerable impact. After the early 1970 breakup of this version of the band, Leon Russell recruited many of its ex-members, excepting Delaney, Bonnie and singer/keyboardist Bobby Whitlock, to join Joe Cocker's band, participating on Cocker's Mad Dogs and Englishmen recording sessions and North American tour (March–May 1970; Rita Coolidge's version of "Groupie (Superstar)" was recorded with this band while on tour). Whitlock meanwhile joined Clapton at his home in Surrey, UK, where they wrote songs and decided to form a band, which two former "Friends"/Cocker band members, bassist Carl Radle and drummer Jim Gordon, would later join. As Derek And The Dominos, they recorded the landmark album Layla and Other Assorted Love Songs (1970) with assistance on many tracks from another former "Friend," lead/slide guitarist Duane Allman. Derek and the Dominos also constituted the core backing band on George Harrison's vocal debut album All Things Must Pass (1970) with assistance from still more former "Friends": Dave Mason, Bobby Keys and Jim Price. 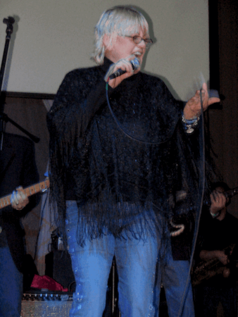 Delaney and Bonnie's daughter Bekka Bramlett has also enjoyed a long history in the music business, most notably as a lead singer with Fleetwood Mac in the early 1990s, and subsequently as a backing vocalist with Faith Hill and Vince Gill. Described in an obituary as a "Southern Legend", Delaney died from complications of gall bladder surgery at UCLA Ronald Reagan Medical Center in Los Angeles on December 27, 2008. Delaney is survived by his widow, Susan Lanier-Bramlett, a brother, John Wayne Bramlett, three daughters, Michele Bramlett, Suzanne Bramlett, Bekka Bramlett, and two grandchildren. 1969 "It's Been a Long Time Coming"
US Charts are Billboard unless otherwise noted. * Cash Box Singles Chart, **Record World Singles Chart. In addition, GNP Crescendo Records (US) and London Records (UK) released an album of 1964-65 and 1967 recordings by Delaney Bramlett in 1971 as Delaney & Bonnie: Genesis. While not a Delaney & Bonnie album per se, Bonnie Bramlett does appear with Delaney on three of this album's twelve selections. ^ Martin, Greg (2002). Liner notes to the 2003 reissue of Delaney & Bonnie's album D&B Together, Columbia/Legacy/Sony Music, catalog no. CK 85743. ^ Martin, Greg (2002). Liner notes to the 2003 reissue of Delaney & Bonnie's album D&B Together. ^ Holzman, Jac and Gavan Daws (1998). Follow the Music: The Life and High Times of Elektra Records in the Great Years of American Pop Culture, FirstMedia, ISBN 0-9661221-1-9, p. 271. ^ Clapton, Eric (2007) Eric Clapton: The Autobiography, Broadway, ISBN 978-0-7679-2842-7, p. 111. Clapton's statement is faulty, as the racially integrated instrumental group the Mar-Keys recorded for Stax as early as 1961. Delaney and Bonnie were among the few white singers to record for the label, however. ^ Bowman, Rob (1997). Soulsville, U.S.A.: The Story of Stax Records, Schirmer, ISBN 0-02-860268-4, p. 175. ^ Holzman, Jac and Gavan Daws. Follow the Music: The Life and High Times of Elektra Records in the Great Years of American Pop Culture, p. 275. ^ Hjort, Christopher (2007). Strange Brew: Eric Clapton and the British Blues Boom, 1965–1970, Jawbone, ISBN 978-1-906002-00-8, p. 250. ^ Holzman, Jac and Gavan Daws. Follow the Music: The Life and High Times of Elektra Records in the Great Years of American Pop Culture, p. 274. ^ Wexler, Jerry and David Ritz (1993). Rhythm and the Blues, Knopf, ISBN 0-679-40102-4, p. 263. ^ Wexler, Jerry and David Ritz (1993). Rhythm and the Blues, p. 253. ^ Clapton, Eric (2007). Clapton - The Autobiography, Broadway, ISBN 978-0-385-51851-2, p. 113. ^ Wexler, Jerry and David Ritz. Rhythm and the Blues, p. 254. ^ See the Rock and Roll Hall of Fame Web site (http://www.rockhall.com/inductees/george-harrison). ^ Hjort, Christopher. Strange Brew: Eric Clapton and the British Blues Boom, 1965-1970, p. 282. ^ Roberty, Mark (1993). Eric Clapton: The Complete Recording Sessions, 1963-1992, Blandford (UK)/St. Martin's (US), ISBN 0-312-09798-0, pp. 54-55. ^ Clapton, Eric. Clapton - The Autobiography, p. 120. ^ See, for example, BMI's entry for "Let It Rain." Information accessed February 12, 2010. ^ Delaney Bramlett: The Death of a Southern Legend, swampland.com, 27 December 2008. ^ Obituary: Delaney Bramlett; songwriter who wrote 'Let It Rain', Los Angeles Times, December 28, 2008. ^ Whitburn, Joel (2015). The Comparison Book Billboard/Cash Box/Record World 1954-1982. Sheridan Books. p. 139. ISBN 978-0-89820-213-7. This page was last edited on 21 April 2019, at 03:26 (UTC).